Tom Holland portrays a young Peter Parker in Spiderman Homecoming that discovers his newfound superpowers. He wears some clothes and outfits that might have caught your attention like when he's wearing pajamas in the street, his cool tshirts, his Midtown School of Science & Technology outfit, etc. We looked for every one of those items so you can easily get them for yourself. So if you want to dress like young Peter Parker in the latest Spiderman: Homecoming movie, check out our complete guide below. If you want to check out Peter Parker's costumes in Spiderman: Far From Home, check out our newest guide. 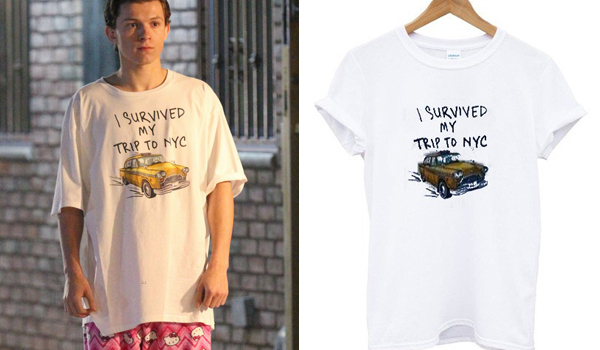 The tshirt that Tom Holland wears in Spiderman: Homecoming for his Peter Parker role in the pajama scene is white, oversized with a "I survived my trip to NYC" quote. 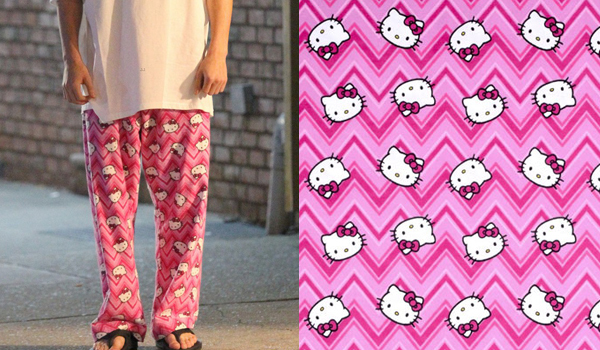 The pants that Tom Holland wears in Spiderman: Homecoming for his Peter Parker role in the pajama scene are pink Hello Kitty pants with zigzags. They are custom made from Hello Kitty Chevron Toss Flannel Fabric. You can buy the fabric here and learn how to easily make pajama pants below. This is also a great family project on a boring weekend ! 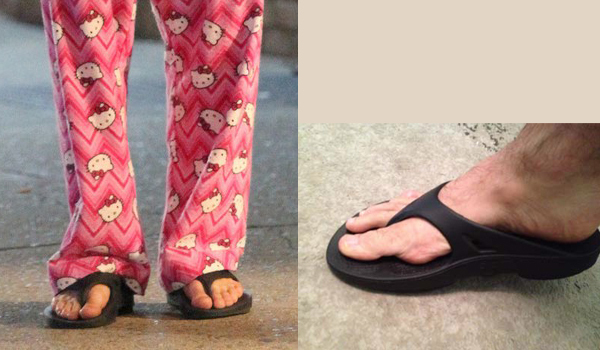 The flip flops that Tom Holland wears in Spiderman: Homecoming for his Peter Parker role in the pajama scene are thick black rubber sandals with a V on front and hole on the sides. They are Oofos Foot Massage Sandals. Now you know Peter Parker takes care of his feet. 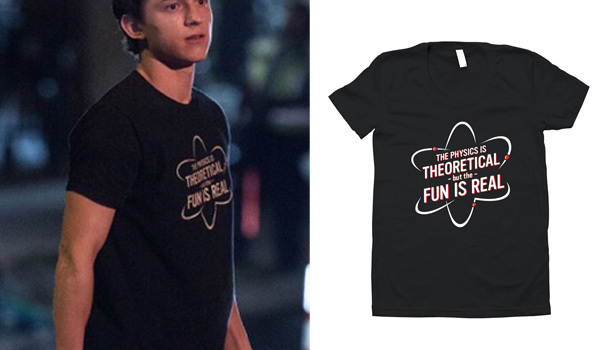 The t-shirt that Tom Holland wears in Spiderman: Homecoming for his Peter Parker role when he is at school and in the car with Tony Stark is a black shirt with the quote "The Physics is Theoretical but the Fun is Real". 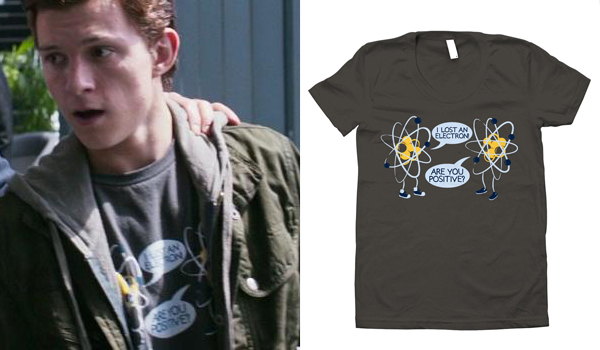 The t-shirt that Tom Holland wears in Spiderman: Homecoming for his Peter Parker role when he is in Tony Stark's HQ is a gray shirt with atoms cracking jokes. One says he lost an electron, and the other answers "are you positive ?". 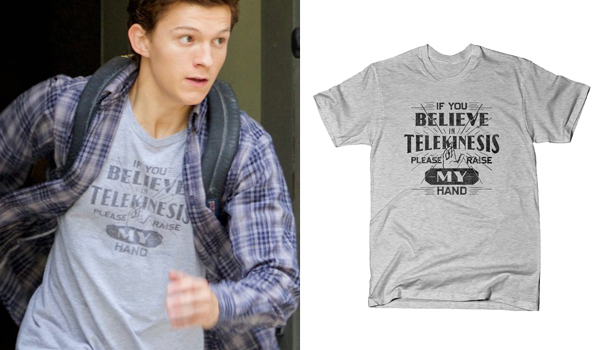 The 3rd t-shirt that Tom Holland wears in Spiderman: Homecoming for his Peter Parker role is a gray shirt with text that says "If You Believe In Telekinesis Please Raise My Hand". It's also a t-shirt from SnorgTees. 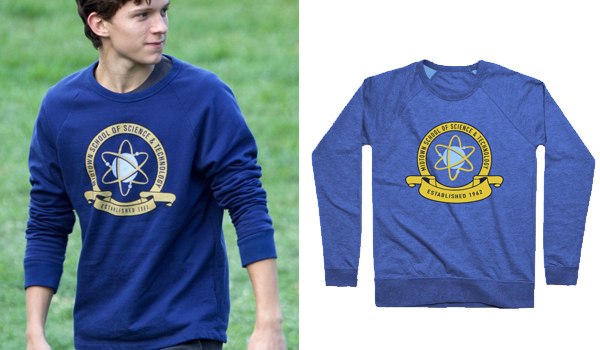 The sweatshirt that Tom Holland wears in Spiderman: Homecoming for his Peter Parker role when he is at school is a royal blue crewneck sweater with a custom "Midtown School of Science & Technology" logo. 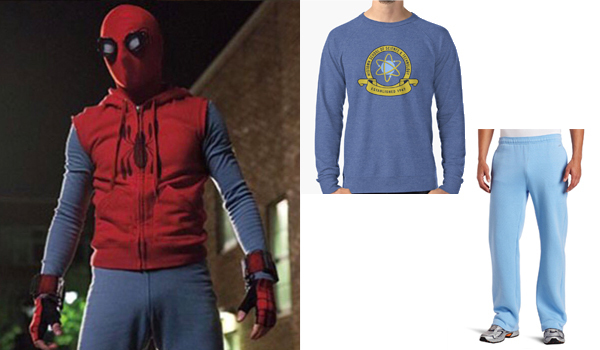 This sweater is actually an easter egg as you can see the school has been established in 1962, year in which Spiderman was first published. 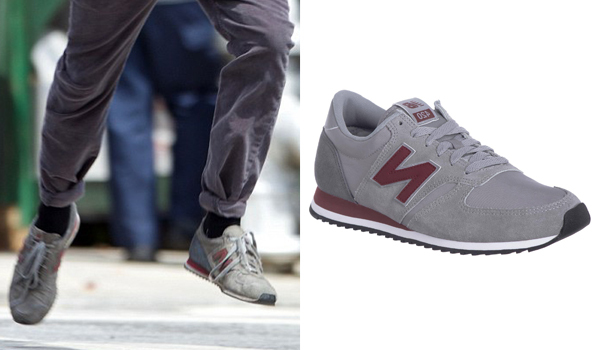 The shoes that Tom Holland wears in Spiderman: Homecoming for his Peter Parker role are grey retro sneakers with burgundy accents. They are New Balance U420 RSB. The exact color combination is discontinued but you might be able to find them at a local sneaker shop. The shoes that Tom Holland wears in Spiderman: Homecoming for his Peter Parker role at school are white sneakers with a blue swoosh and beige sole. 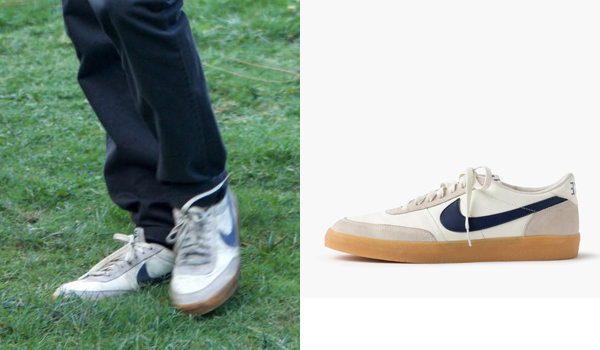 They are Nike® for J.Crew Killshot 2 sneakers. 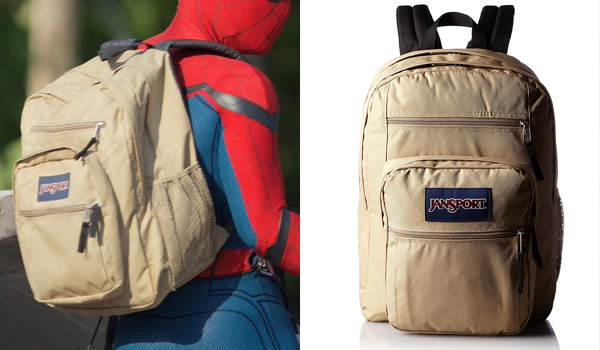 The backpack that Tom Holland wears in Spiderman: Homecoming for his Peter Parker role is a tan backpack with black shoulder straps. It is the JanSport Big Student Backpack in Field Tan. 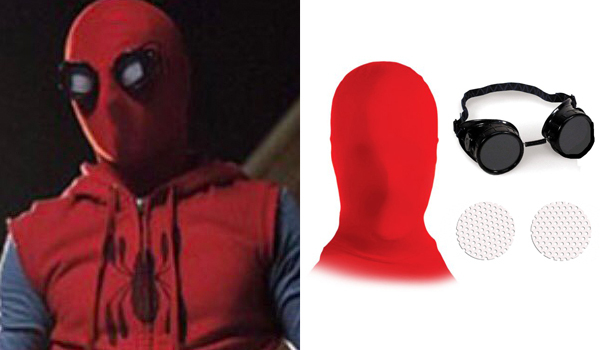 The mask that Tom Holland wears in Spiderman: Homecoming for his Spiderman role in his first costume is custom made for the movie. You can easily replicate it by combining a red spandex mask, goggles and white mesh. Don't forget to add black tape to shape the rectangles of mesh. 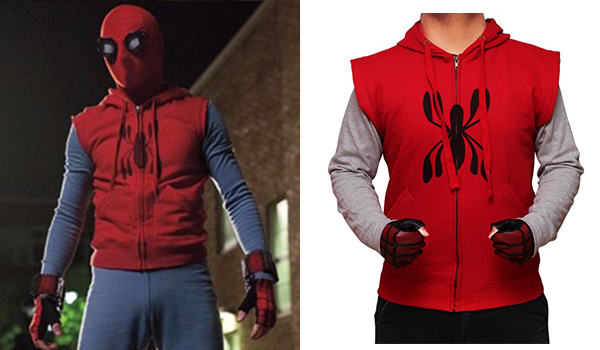 The hoodie that Tom Holland wears in Spiderman: Homecoming for his Spiderman role is a red sleeveless hoodie with a black spider on the middle. 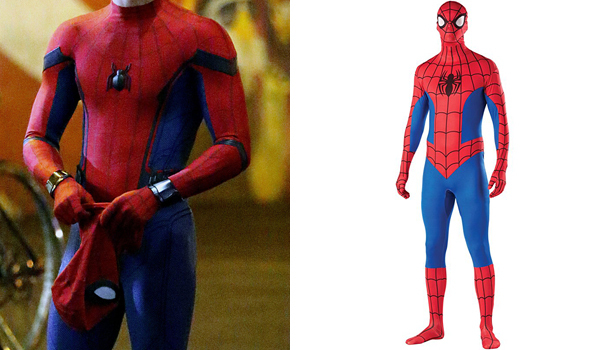 The sweatsuit that Tom Holland wears in Spiderman: Homecoming for his Spiderman role is a light blue sweatsuit. We recommend the school sweatshirt above so you get two costumes in one. 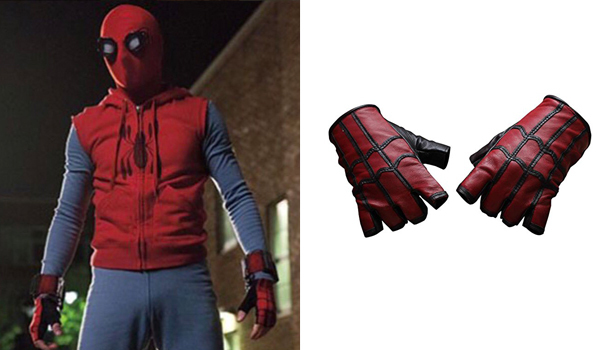 The gloves that Tom Holland wears in Spiderman: Homecoming for his Spiderman role are black and red gloves. These are made of real sheepskin leather, and other than a costume accessory can be cool looking driving gloves ! 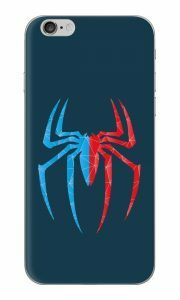 The costume that Tom Holland wears in Spiderman: Homecoming for his Spiderman is custom made for the movie. It is made of some thick athletic fabric and has a 3D spider added to it. This outfit by Rubies costume is the most resembling and it's at an affordable price. Oops ! Updated, thanks ! What shoes does Peter Parker wear when he is in his homemade costume? The red ones? Sockwa Red G4. They only have the old style version available in M5/W6, M6/W7. M7/W8, M9/W10 & M10/W11 but they are the real deal. Do you know where I can get his hoodies and plaid shirt? fjackets.com sells the exact thing you are looking for. I do not think you can find the exact version of the plaid shirt he wears, but there is this amazing website hubofleather.com which sells the exact version of his hoodie he wears in the movie. Hubofleather.com search ‘Grey Zip-Up Hoodie Tom Holland’. 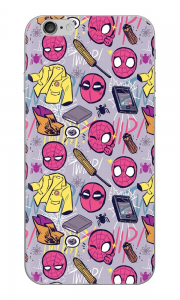 What shoes does Peter Parker wear when he is getting ready for the last dance of the school year ? Julien they look like black converse all stars. I would like to know where to find the outfit he is wearing at the beginning of the movie; the grey sweater and plaid shirt. What tie did he have on for the homecoming dance? (From what it looks like, it’s a blue plaid tie with white, red and teal(?) stripes but can’t seem to find it anywhere.) Any ideas? Looks like you are gonna have to wing it. They are high top (sorry about the mistake). 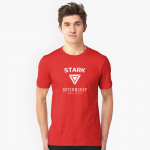 Isn’t there supposed to be another shirt that Peter wears when he finds his Spider-Man suit from Mr.Stark at the end? What about his yellow sports coat?